Turns out there are still plenty of Cyber Monday Nintendo deals to be had, including this amazing deal on a Nintendo Switch from Best Buy. 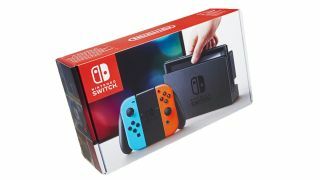 The online retailer is offering a Nintendo Switch with a $35 eShop card for just $299, meaning essentially you get $35 credit to spend on top notch eShop titles for free. That's about the best price you're going to find on a Nintendo Switch this Cyber Monday, if you live in the US. You'll want to jump on this online-only deal ASAP if you're in need of a Nintendo Switch, or plan to give one as a gift during the holidays. The $35 eShop credit will come in handy for amazing games on the eShop like Hollow Knight, Stardew Valley, and Golf Story. Nintendo's offering this special deal when you buy a Nintendo Switch through select retailers on November 26 only (while supplies last). This deal's so good, you'd think Nintendo decided to just give away money on Cyber Monday - and you'll be all the richer for it. And don't worry if you think you've missed out on this deal while it lasts, we'll be bringing you all the latest Cyber Monday game deals as they happen, meaning you just have to check our hubs for all the best deals.